I was tossing and turning through the night, and woke up at almost 3am. Wow, this time 8 years ago I held him in my arms for the first time, and now here we are, lying like logs side by side, sometimes like out stretched branches that interlock and catch on one another through the rythm of slumber and restlessness. We sometimes switch beds 2 or 3 times in a single night as he likes the security and closeness of my arms blanketing him. I’m torn between feeling smothered and feeling loved, but I know this time in our lives is very brief. Jef surprised him this morning with a giant helium balloon in the form of the letter K. “K for Kien!” We FaceTimed Jef and he said he needed to explain the presents that were wrapped up under the balloon. I suggested that maybe Kien might want to open his presents when daddy got home. He agreed wholeheartedly. My darling, Kien. It’s been a big year of growth, and I love watching him blossoming in front of me. I love getting texts from him. I love how he waves to me every single morning from his classroom window until we can’t see each other anymore. I love finding notes that says “to mummy” and inside the folded up paper are these drawings. He’s a sweet little boy who grinds his teeth and thrashes around in his sleep. He loves his beyblades, Donald Duck cartoons, Dr Seus stories, YouTube, berries, spotty bananas. He’s feisty and makes up the silliest of jokes. 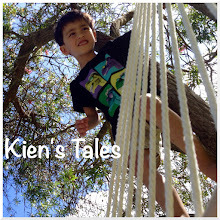 He is a Kien, the Kien, our Kien, my little kiwi koala...and he is now Eight!